Are you of Ashkenazi Jewish descent? Are you considering having a baby? If you answered yes to either of these questions, you should consider carrier screening with VeriYou. 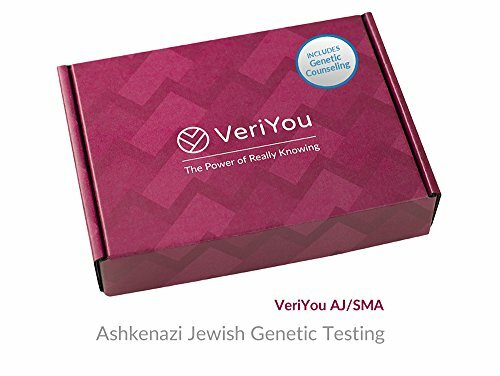 The AJ/SMA test is a highly accurate genetic test that allows you to learn if you may be a carrier of genetic disorders that are prevalent in individuals of Ashkenazi Jewish descent. To ensure you understand what your results mean, a consultation with a board-certified genetic counselor is included. VeriYou’s AJ/SMA test provides insightful and actionable information to help you plan for the future. If both you and your partner are carriers for the same genetic disorder, there is a 25% chance your child will be affected by the disorder. Order your easy-to-use at-home “spit” kit and a licensed physician will review your order. Simply provide your saliva sample and mail it back to us in the prepaid mailer and your confidential results will be delivered securely online. More than 100,000 prospective parents have already been tested through our advanced DNA sequencing methods. Note: We cannot accept samples from NY currently but will soon! If you have any questions about this product by VeriYou, contact us by completing and submitting the form below. If you are looking for a specif part number, please include it with your message.